ปั๊มชนิดนี้มีอุปกรณ์ยึดผนัง ข้อต่อ ¾” ,ปลั๊กไฟฟ้า 220 V 50 Hz พร้อมติดตั้งและใช้งานได้ทันที Plus & Play. 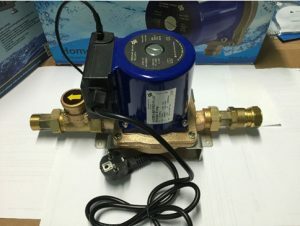 In some cases, additional pressure is required for optimum operation of, for example, a (power) shower or the supply of additional water pressure for a washing machine or boiler on a higher floor. A big booster system is not necessary, the Home Unit Pro Plus offers the solution. The Professional Home Unit Pro Plus is a compact pressure boosting system for individual drinking water applications. When in use, it provides an additional pressure of 1 bar, on taps where it is desired. The installation is very quiet and the pump sustainable, only when there is demand for water the Home Unit Pro Plus is activated. The Home Unit Pro Plus is delivered complete with 22 mm compression fittings and run-dry protection. By this the unit meets the legal requirements. With the included wall bracket the installation is quick and easy to assemble. The couplings of the Home Unit Pro Plus are manufactured in a way that the unit can be mounted without soldering. With the " Plug & Play " connection it is immediately ready for use.